Laurie Berkner has always been one of our very favorite children's music artists. We were always singing along to her songs... and dancing to the music. We were always so excited when she would come on Nickelodeon on Jack's Big Music Show. We've been to see her and her band in concert multiple times. We've had all of her albums, her DVD, and when I was contacted about her new children's book I jumped at the chance to read it and share it with you. I was provided with a copy of the book in order to review. All opinions are my own. 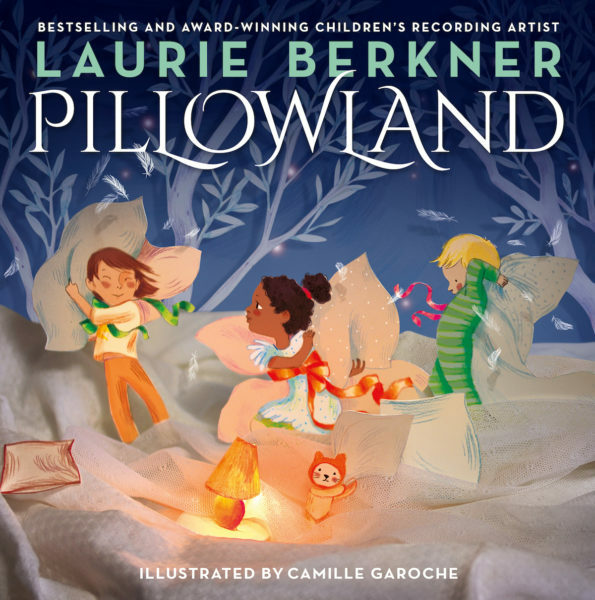 Laurie Berkner’s treasured song “Pillowland” is now a beautiful picture book! Featuring magical, lush art by Camille Garoche, Pillowland carries readers away to a feather-fluffed dream world where bedtime is always a grand adventure. I know a place, a kingdom far away, where people wear pajamas every night and every day. Where all the houses, the buildings, and the trees are made of fluffy pillows that are soft as they can be. We’re going to land in Pillowland! Laurie Berkner can pretty much do no wrong in my mind. I imagine she was a ridiculously amazing preschool teacher. Her music videos always made me smile. The Laurie Berkner Band puts on an amazing show, too. Zoe and Ana would wander around playing and singing her songs all the time. With Zoe and Ana now being oh so grown up at 12 and 9 we've moved on to "real music". Forget that kid stuff. But, I still have the albums in my music list and will occasionally listen to Laurie Berkner... and Pillowland is one of my favorites. The newer version that was just recently released (in the above video) with her book is simply lovely. And now... she has the Pillowland book! A place where people "wear pajamas every night and every day." Who wouldn't want to live in Pillowland? I know I do. This really does make a perfect little bedtime story. Obviously the words make it a very melodic read... and then the addition of the illustrations adds something just a bit special. They simply have a softness and light to them. Truly magical. The book definitely inspires a feeling of comfy coziness... although you might have to look out for a pillow fight once in a while! If you've been looking to add another book to your bedtime collection I can highly recommend Pillowland. Recognized as “the queen of children’s music” (People), Laurie Berkner is a singer, songwriter, lyricist, author, and founder of Two Tomatoes Records. She has released twelve bestselling, award-winning albums, was the first recording artist ever to perform in music videos on Nick Jr., and appeared regularly on the network’s Jack’s Big Music Show. Laurie helped develop the short-form animated series, Sing It, Laurie!, on the twenty-four-hour preschool television channel Sprout, and has written music and lyrics for three Off-Broadway children’s musicals. A project close to her heart has been designing the curriculum and training teachers for Laurie Berkner’s The Music in Me, an early childhood music program based on her music and classroom philosophy. Learn more at LaurieBerkner.com. Camille Garoche studied at the École des Beaux-Arts de Cergy and the Maryse Eloy. Her 3-D, cut-paper illustrations have been exhibited throughout Europe. She is the author-illustrator of Fox’s Garden and The Snow Rabbit. Camille lives in Paris with her partner and two daughters. Visit her online at PrincesseCamCam.Tumblr.com.